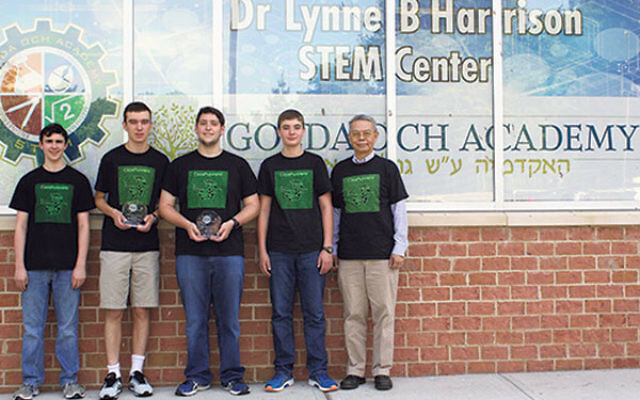 The CodeRunners, the robotics team from Golda Och Academy in West Orange, is one of only six teams in North America qualifying to enter the International RoboCup Junior Soccer Competition taking place June 30-July 4 in Leipzig, Germany. The only team in their division to represent the United States in the international contest, the CodeRunners secured a first-place win at the RoboCup Junior USA soccer competition at The Horace Mann School in the Bronx April 17. The international competition brings together more than 500 teams from 40 countries showcasing STEM education, advanced robotics, future technology, and international cooperation and sportsmanship. CodeRunners members Aytan Geschwind, Benjamin Soudry, Nadav Soudry, and Alex Rothschild will represent GOA in Germany. In the soccer challenge, teams of two autonomous mobile robots compete against another team in matches. The robots play on a six-by-eight-foot field with an infrared light-emitting ball, trying to score into a color-coded goal in a special field. “The team has been working incredibly hard on designing, building, and programming their soccer robots during the past two years,” said CodeRunners adviser Dr. Arco Jeng. Corporate sponsors include Harrison Research Labs, Inc., Online Computers and Communications, and Richards Manufacturing.